It's fair to say that we are a family of book lovers in this house. 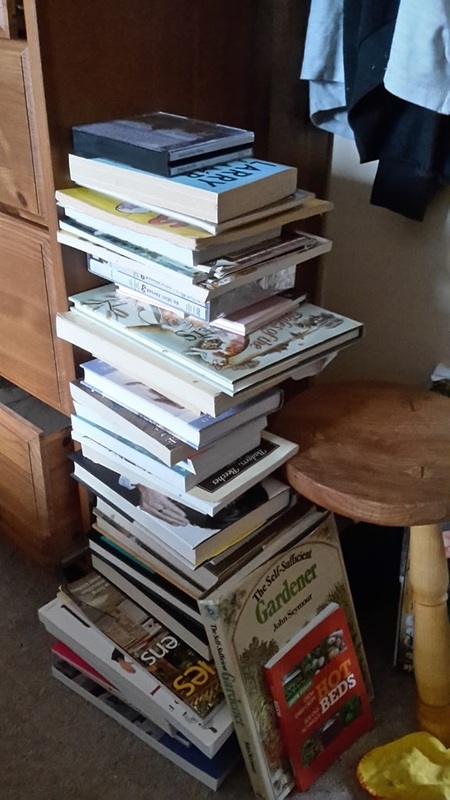 When we moved house five years ago our helpers moaned because we had 23 boxes of books, but the problem has only got worse - I buy a lot of books! I realised this yesterday when I decided to clean out the books under my side of the bed. I often take a book up with me to read and quite often have multiple books on the go at once, and I'm terrible for leaving them by the side of my bed. I got them all out and dusted them off and it turned out to be quite a stack! Trouble is all the book shelves are full and there's quite a few of them around the house as well!. Earlier in the year my wife bought me a kindle for my birthday, I'd put off getting one for so long, my brother, another bookworm, even refers to them as the "Antibook". I asked my wife because I was reading a series of print-on-demand books from America and it was going to work out more expensive to buy four books than the kindle. I've been really pleased with it. I find it easy to read and use, there's a great selection of books out there and it doesn't take up much space! It'll never replace paper books in this house but it is a great way to own certain books without then feeling guilty about getting of them afterwards (fiction). Another great part of them is the ability to download a small sample of a book, I've done this lots of times and it's saved me a bit of money when a book wasn't quite what I thought it was going to be (a good example of this was a market gardening book where it was being run in a commune - with endless free labour! Not quite what I'm up against here!). So who else has succumbed to the dreaded ebook and is liking it? Nope, no e-books here. I know our house will sink into a very deep hole one of these day because of the weight of all these books.. but hey.. who cares, lol! I just love the smell and the feel of a book. I think (but please correct me if I'm wrong!) that the light from the e-reader would irritate me in the end. What is your experience with that? There's no light from mine so it feels just like you're reading a book. That was what put me off for so long. I've been reading this one for six months now and I have to say I find very little difference between that and a real book. The room needs to be lit up to read it. I've had people trying to get me to use the ebooks for years but I LOVE a book--every bit of it. I have, however, changed the way I do books. I BORROW from the library first. If it is a FANTASTIC book that I couldn't live without , then I buy it. This of course ends up being Non fiction--reference type books or the occasional book of essays that are so good that I know I'll want to reread them every winter. This way has cut my book purchases from the usual 50-100 per year down to 4 or 5. That's a HUGE difference. I've had my Kindle Paperwhite for 4 years now. Obviously I've had my reservations, but I'm very happy with it. I only read in bed at night and it works a treat. It is light weighted so my arms, wrists and fingers don't get so tired and sore from holding a real book. We still buy books (non-fiction) but not to the extend we did before. And we haven't unpacked all the boxes from our last move yet (3 years ago). Not enough wall space for bookshelves AND art. I packed up my most of our books and now I am thinking of unpacking them. I haven't got the heart to part with them though. They do take up lots of room and are great for collecting dust. I have a tablet and do download books. Especially free Classics for Sol's online book club. I prefer the feel of a paper book and find the print fonts are not brilliant on these electronic reading devices. Who said "Books Do furnish a Room"? Can't say the same about e readers. And come the apocalypse we can burn books to keep warm!! No Kindle here, although all my friends moan that I'm behind the times. I probably will give in but I've only just got my reading mojo back so I'll stick with paper for now! My husband got me the very first iPad on the very first day. I've not looked back. I hate paper books now, and generally only bother with them when I check them out of the library. I love the feel of a real book, but my iPad is handy when on holiday. We have started a reading group in work and sway books a great way to find new authors. I used to buy loads of books until 20 years ago I lost my eyesight. Over the past five years it has returned to a small degree - I'm now SSI (seriously sight impaired). Without my Kindle I wouldn't be able to read at all. I use the largest font and also a magnifier - only get a few words to each page, but I am so grateful to be able to read at all. I purchase some titles but also use Kindle Unlimited, and go through about 12-15 books every month. Only real books in this household. I've bought a couple ebooks but real books are my deep love. I love to own them, highlight them, dog-ear them, and dirty up their margins. Also working on writing one. Love all books. Even those I don't care for much become the lower part of my book towers. I rarely buy new books but get them at thrift shops and library sales instead. I am a book hoarder too... Up until recently, I tried to restrict myself, knowing that without a permanent place to live each time I moved houses would be more painful with the ever-increasing amount of books. But now that I have my own house, the book demon has been unleashed!! I have a Kindle, bought it a few years ago, but I only really use it when I travel. It's a good thing to have on a plane or in a hotel - but nothing can replace a real book, so at home the Kindle doesn't really get used. We use iPads and a Pandigital Novel reader. Both are backlit and this is great. The light is adjustable for brighter or darker times. The nicest thing is the type size is adjustable, too. So when my old eyes are tired in the evening, I can 'up' the font size and still read comfortably. So many books are free online and from the digital division of our public library I hardly every buy a digital book. I wouldn't want to be without my ereaders. That said.... I also would never give up my paper books, either! Reference books have never been replaced here with digital ones. And how can I put sticky notes on my ereader which stick out as a location reminder? So, 'all of the above' is our choice. One doesn't replace the other, they all just add together to aid us in our pursuit of being lifetime learners. I love real books, as anyone who reads my blog will know, but I do have a Kindle. I use it mainly for reading when I'm out and about, in waiting rooms for instance. But I have a terrible habit of pressing the wrong things or swiping the wrong way and totally losing where I am and by the time I find my place my reading time is usually up ... real books are so much easier even if they do take up so much space. I love my Kindle and Kindle app for Ipad. Three main reasons - travel, borrowing ebooks from the library, able to read in bed without a light on, so I don't disturb my husband. I can travel the world with literally hundreds of books in my carry on bag, and have borrowed more from my local library while in my hotel room in Cambodia, or England or New Zealand or... Anywhere there's a wifi connection. I'm a bookworm and a Kindle fan, proof that the two are not mutually exclusive!